A Major and three top LeT commanders were among six persons killed in the 24-hour-long fierce gunfight that ended this afternoon in the central Kashmir district of Badgam. 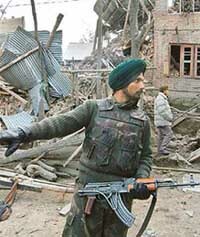 An Army jawan stands guard outside a damaged house where three militants were killed after a 24-hour gun battle at Batpora, 15 km from Srinagar, on Friday. Will broadband services give a fillip to IT in India? Unfazed by the confusion surrounding the Congress and RJD strategy in the Bihar Assembly elections, another UPA partner Lok Janshakti Party leader Ram Vilas Paswan today expressed total support to the Congress, in an apparent bid to wean it away from Laloo Prasad’s party. Indian Air Force chief S.P. 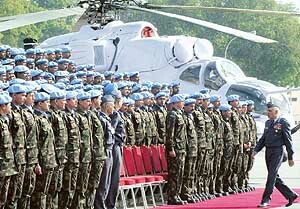 Tyagi (right) arrives to greet his troops in New Delhi on Friday before their departure for Congo as part of the UN Mission. The Congress list of candidates for the Haryana Assembly elections, at the first glance, gives the impression that the former Chief Minister, Mr Bhajan Lal, has outmanoeuvred his opponents within the party by cornering a major chunk of the seats for his men. Tens of thousands of goats have sensed the fear of death lurking in the bone-chilling air that hangs heavy in the stark hillsides of the Jaunsar-Bawar tribal valley. The government will soon come out with a “decisive plan” on the demand to build a “sea wall” in densely populated coastal areas of the country, Water Resources Minister Priya Ranjan Dasmunsi said today. Creating a flutter, a 17-year-old girl today broke the security cordon at a function of President A.P.J. Abdul Kalam at a hamlet here and handed over to him a memorandum alleging her family’s land has been usurped by the village head and her father faced death threat. A poor illiterate girl from this city, who has three sisters waiting for her to get married, yesterday refused to marry a repentant groom whose family members got physical with her sister and other women during her pre-wedding reception on January 12.